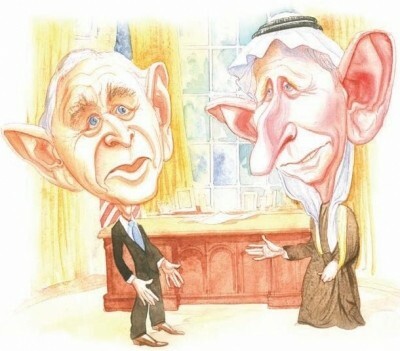 In a 1997 Middle East Quarterly article titled "Prince Charles of Arabia," Ronni L. Gordon and David M. Stillman looked at evidence that Britain's crown prince might be a secret convert to Islam. They shifted through his public statements (defending Islamic law, praising the status of Muslim women, seeing in Islam a solution for Britain's ailments) and actions (setting up a panel of twelve "wise men" to advise him on Islamic religion and culture), then concluded that, "should Charles persist in his admiration of Islam and defamation of his own culture," his accession to the throne will indeed usher in a "different kind of monarchy." Prince Charles, a would-be Muslim? Charles with worry beads, Camilla with shawl. June 21, 2004 update: Sultan Hassanal Bolkiah of Brunei will award Prince Charles a $50,000 prize chosen by an international jury set up by the Oxford Centre for Islamic Studies for his contribution to understanding Islam in the West during a London ceremony on June 24. He is the first non-Muslim to receive the prize established in 1992. Other winners have included Youssef Al-Qaradawi, Abdul Fattah Abu Ghudda, and Adnan Mohd Zarzar. Dec. 18, 2004 update: Prince Charles put himself in the middle of an Islamic theological issue that again could suggest his conversion to Islam – for if that is not the case, then on what basis does he opine on the Islamic law requiring that apostates from Islam be executed? Jonathan Petre of London's Daily Telegraph reports on a private summit of Christian and Muslim leaders at Clarence House on this topic sponsored earlier in December by the prince. Apparently, however, he did not get the results he hoped for, with one Christian participant indicating that Charles was "very, very unhappy" about its outcome. That may have been because the Muslims at the meeting resented his public involvement in this topic. some deeply evil influence has been brought to bear on these impressionable young minds. ... Some may think this cause is Islam. It is anything but. It is a perversion of traditional Islam. As I understand it, Islam preaches humanity, tolerance and a sense of community. ... these acts have nothing to do with any true faith. ... it is vital that everyone resists the temptation to condemn the Muslim community for the actions of such a tiny and evil minority. If we succumb to that temptation, the bombers will have achieved their aim. Likewise, in my view, it is the duty of every true Muslim to condemn these atrocities and root out those among them who preach and practise such hatred and bitterness. Comment: This sounds to me like the same apologetics churned out by the Muslim Council of Britain and other Islamist bodies. Aug. 2, 2005 update: At the funeral of King Fahd in Riyadh, the Associated Press reports, "Non-Muslims were not allowed at the ceremonies." So far as I can tell, Charles did not attend the ceremonies. (There surely would have been a press uproar if he had.) We can conclude that whatever his inner faith, he is not presenting himself as a Muslim in public. In brief, he is not a Muslim at this time. 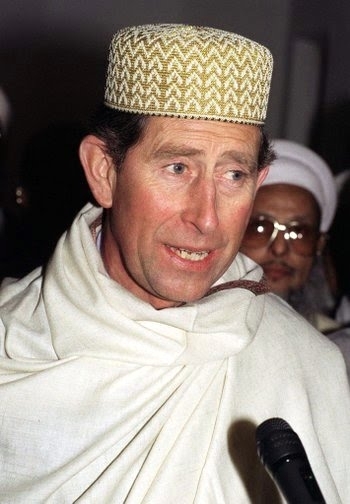 Sep. 4, 2005 update: Prince Charles revealed in a letter leaked to the Daily Telegraph that he had strained relations with George Carey, then archbishop of Canterbury, over his attitude toward Islam. Particularly contentious was his expressed intent, on becoming king and supreme governor of the Church of England, to ditch the centuries' old defender of the faith title and replace it with defender of faith and defender of the Divine. The letter reveals the archbishop's reaction. According to royal aides, Charles did not much respect Lord Carey's views and the feelings were reciprocated. will try to persuade George W Bush and Americans of the merits of Islam this week because he thinks the United States has been too intolerant of the religion since September 11. The Prince, who leaves on Tuesday for an eight-day tour of the US, has voiced private concerns over America's "confrontational" approach to Muslim countries and its failure to appreciate Islam's strengths. Apparently, he "wants Americans - including Mr Bush - to share his fondness for Islam." In the first part of the 20th century, our nations stood together to ensure that fascism did not prevail in Europe. In the second half of the 20th century, we worked tirelessly to defeat the totalitarian ideology of communism. And today we're fighting side by side against an ideology of hatred and intolerance to ensure that the 21st century will be one of liberty and hope. Charles did not reply to this comment, limiting his response to projects for the underprivileged and fond memories of Winston Churchill. "The prince comes calling" (drawing by Roman Gann, National Review, Nov. 21, 2005). Nov. 3, 2005 update: Ali Sina proposes a reason for Charles' attraction to Islam, suggesting that he may be tired of democracy: "Does he secretly envy the Islamic system of government where the rulers have absolute power and can even impose morality on their subjects?" Nov. 5, 2005 update: Sharp-tongued Julie Burchill asks in "What's not to like about Islam if you're the Prince of Wales,"
I wonder why Prince Charles seeks to big up powerful, theocratic Islam — which already controls so much land and wealth and yet will kill and kill to gain more — and not vulnerable, pluralistic Israel? Why doesn't he invest as much energy in defence of the persecuted and murdered Christians who suffer for their beliefs under Islamic regimes? Well, I think I know why; because cleaving to Islam is the one way that men who wish to appear liberal and enlightened can promote reactionary ideas. Monarch-worshipping, woman-oppressing, non-democratic — what's there not for Charles to like! 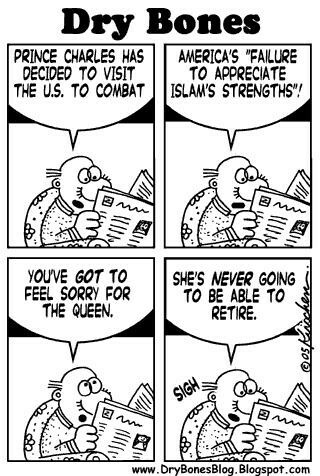 Nov. 13, 2005 update: Charles' efforts to promote Islam does his mother no good in Al-Qaeda's eyes. In a just-reviewed videotape, the organization's number two, Ayman al- Zawahiri, calls Queen Elizabeth II "one of the severest enemies of Islam" and blames her for what he calls Britain's "crusader laws." In addition, he criticizes British Muslims who "work for the pleasure of Elizabeth, the head of the Church of England" and ridicules them for saying (his words, not theirs): "We are British citizens, subject to Britain's crusader laws, and we are proud of our submission . . . to Elizabeth, head of the Church of England." Jan. 19, 2006 update: As patron of the Festival of Muslim Cultures, which its website describes as a national celebration of "the rich cultural and artistic expressions of the Muslim peoples," Charles will be visiting Sheffield soon. He will tour an exhibition there, "Palace and Mosque: Islamic Treasures of the Middle East," that launches the festival. The prince is said to be keen to see the exhibition. He will also meet school and community groups and watch a performance by a group of Muslim women and girls. Jan. 26, 2006 update: The Prince of Wales expressed his pleasure today at the progress in the UK of Shar'i banking products at a conference in London to mark the 30th anniversary of the Islamic Development Bank: "I am certain that with the support of the Islamic Development Bank my charities will be able to increase their efforts to address the challenges we face in Britain's cities and help those younger British Muslims who feel they have little or no stake in society to play a fuller part in the country's affairs by promoting community and entrepreneurial development." Mar. 21, 2006 update: Charles weighed in on the Muhammad cartoon controversy, telling an audience of more than 800 Islamic scholars at Cairo's Al-Azhar University in what the Times (London) called a "serious, impassioned 30-minute speech" that "The recent ghastly strife and anger over the Danish cartoons shows the danger that comes of our failure to listen and to respect what is precious and sacred to others. In my view, the true mark of a civilised society is the respect it pays to minorities and to strangers." What is so distinctive of the great ages of faith surely was that they understood, as well as sacred texts ... the meaning of God's word for all time and its meaning for this time. ... it was Islam's greatness to understand this in its full depth and challenge. This is what you ... can give not only to Islam but by example to all the other children of Abraham. 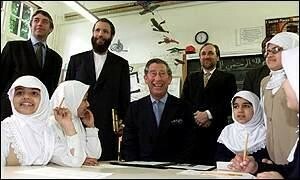 Prince Charles meets the children at Yusuf Islam's Islamia Primary School, London. Speaking of Islamic education, here is a remedial news item: back in March 2000, Prince Charles visited the Islamia Primary School in North-West London. This, Britain's first state-funded Muslim school, was founded and is headed by Yusuf Islam (a.k.a. Cat Stevens), an Islamist who threatened Salman Rushdie's life during the Satanic Verses controversy and has since been banned from entering the United States. The Prince told the children: "You are ambassadors for a sometimes much misunderstood faith. I believe that Islam has much to teach increasingly secular societies like ours in Britain." This planet's survival will depend on you understanding that you can achieve unity through diversity; that you can in fact build on living, timeless traditions that are a part of your unique culture and still be "modern". It will also depend on you realizing that the planetary crisis we face is so profound in its rapidly developing consequences that we simply cannot afford to go on squabbling amongst ourselves while we destroy the world around us at a truly terrifying rate. As it says in the Qu'ran – "Only they pay attention who have hearts; only they believe (or see signs) who have hearts." Have you seen the signs? Will you trust in what your hearts are telling you? In the wake of Prince Charles's visit to Pakistan, now is an apt time to reflect on the strange hold that royals, and he in particular, have over Muslims. It may sound paradoxical, but it's not surprising that when Labour ministers queue up to tell modest women to take their veils off, there is a special affection for a prince whose public utterances on the subject have been marked by a sort of bumbling Islamophilia. Charles and Camilla's visit to Pakistan was a really important trip for my mum. She is obsessed with the royal family. Lots of mums are but, really, you have no idea how big the royals are with Bangladeshi women. My friend Koruna will tell me, "You think your mum is obsessed, but I bet she doesn't have a showcase filled with royal-family china like my aunts." Of course she does - we had entire commemorative sets of Diana and Charles plates, eggcups, the works, in our living room. "Yeah," Koruna replies, "but a whole showcase in a mud-shack village in Bangladesh?" Thousands of households in the subcontinent give pride of place to royal kitsch, and that is as much the case in the volatile Islamic states of Pakistan and Bangladesh as it is in India. A survey of my Asian mates confirms this grim predicament - the royal cult, and in particular the icon that is Diana, is being propped up by Muslim women all over the world. 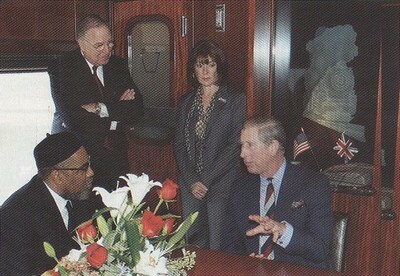 Kenny Gamble, Bennett and Vivian Levin, and Prince Charles chat about urban renewal. 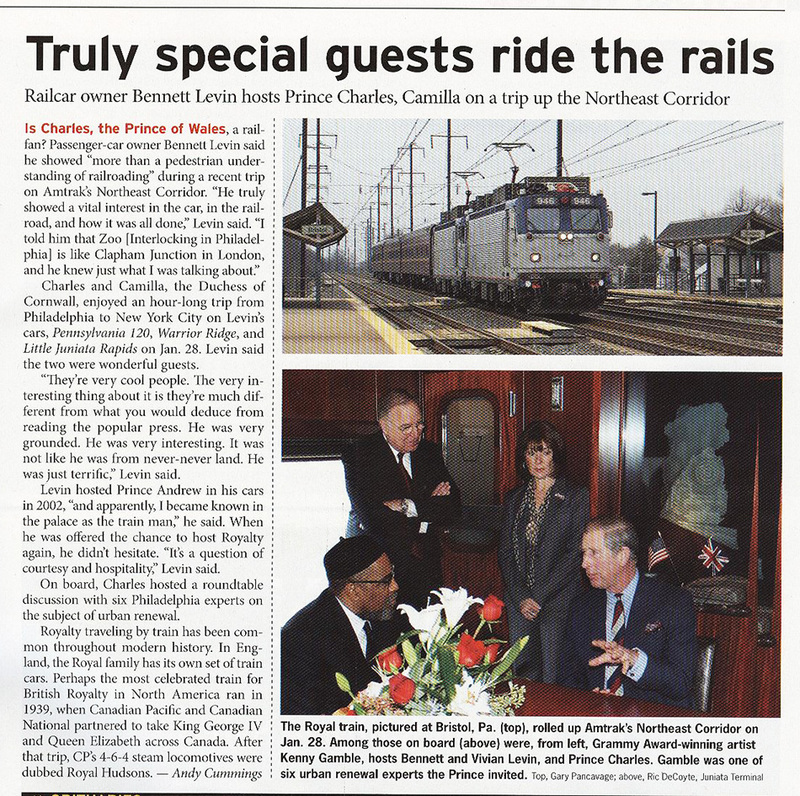 May 13, 2007 update: The American Trains Magazine carries an article in today's issue, "Truly special guests ride the rails," about Charles and Camilla training from Philadelphia to New York City on the special cars belonging to Bennett Levin. On board, the article informs us, "Charles hosted a roundtable discussion with six Philadelphia experts on the subject of urban renewal." And who should one of those "experts" be but the notorious Kenny Gamble (aka Luqman Abdul-Haqq), seen prominently talking to the prince? May 26, 2007 update: The BBC has announced a forthcoming world premier performance. Sir John Tavener's major new work, The Beautiful Names will be introduced on June 19 at 7:30 p.m. in Westminster Cathedral. The BBC Symphony Orchestra under Jiří Bĕlohlávek will join forces with the BBC Symphony Chorus and Westminster Cathedral Choir. The Beautiful Names sets the 99 names for Allah as culled from the Qu'ran, sung in Arabic. "Inspiration for the piece came to me as a vision," says Tavener, "and the music just came to me immediately I saw the Arabic word." He has worked closely with the Arabist Michael Macdonald to ensure correct pronunciation and stress – "the sound actually does help create the music." The 70-minute work is divided into eleven groups of nine "tonal zones" and the start of each new section is prefaced by a magisterial calling out of Allah. Making his strongest reference yet to Islam, Tavener also calls upon Sufism, Hinduism and Buddhism in his choice of structure, instrumentation and tonality. Program notes by Tavener spell this vision out in greater detail. Tickets are on sale for £24, £20, £16, £12, £8. Oh, and the work was commissioned by HRH The Prince Of Wales." So much attention is paid to the outward differences between Faiths. Almost reflexively, this becomes translated into seemingly impenetrable divisions between people; people who – if they did but know it – are in fact linked by much and separated by rather little. How refreshing it is, then, to be reminded by this marvellous exhibition of the spirituality from which our Faiths draw their real strength, and of the heritage and traditions which we share. The prince and Camilla watch the Whirling Dervishes. Nov. 27, 2007 update: Two points of note in a Times (London) article by Alan Hamilton, "Whirling dervishes' star turn caps Prince's homage to Islamic mystic." Writing from Konya, Turkey, about Prince Charles' visit there to the shrine of Mevlana Jalal ad-Din Rumi during the 800th year of Rumi's birth, Hamilton mentions as an aside that "The Prince disclosed yesterday that he had paid a private visit in 1992 to the shrine." After watching ten whirling dervishes perform at a cultural center, Charles stated in a speech: "Whatever it is, it seems to me that Western life has become deconstructed and partial." The East, on the other hand, he went on, had given us "parables of the soul." He also cited the Koran and Hadith. It bears noting that Charles is not the royal family's only link to the Muslim world, for Princess Diana, Charles's ex-wife, has often been linked to Hasnat Khan, a London-based cardiac surgeon. Just as Charles donned a Muslim prayer shawl, Di wore a traditional shalwar kameez during her visit to Khan's family in Pakistan. London's Sunday Mirror reports that Khan's family has approved a possible marriage of the divorced 35-year-old princess and their son, then quoted the princess (via a "friend") to the effect that she hoped Khan would father a half-sister to her two sons, princes William and Harry. While Diana's divorce from the heir to the British throne removes her personally from the royal family, her sons could be the first heirs to the British throne with a Muslim stepfather. Dr Hasnat Khan, a Muslim, ended his relationship with the Princess only months before her death after concluding that a marriage between them would be doomed to failure. Dr Khan told his family: "If I married her, our marriage would not last for more than a year. We are culturally so different from each other. She is from Venus and I am from Mars. If it ever happened, it would be like a marriage from two different planets." ... Mr Khan said his son had explained to him that Diana was "independent" and "outgoing". But, added to their different faiths, it meant that his son - despite considering asking her to marry him - could not envisage their relationship lasting. The inquest into the Princess's death heard evidence last week from one of her closest friends, Rosa Monckton, that Diana had no plans to marry her boyfriend Dodi Fayed, who died with her in a Paris car crash 10 years ago, and that she was still infatuated with Dr Khan. Ms Monckton said the Princess had been "deeply upset and hurt" when Dr Khan broke off their relationship in the summer of 1997. "She was very much in love with him. She hoped that they would be able to have a future together. She wanted to marry him," she told the hearing. ... It is understood that at one point the Princess was willing to convert to Islam in order to marry him but abandoned the idea when he took the decision that their relationship could not work in the long term. held long discussions about the Princess's love life during a holiday they shared in the Greek Islands two weeks before Diana died. The Princess spent far more time talking about Hasnat Khan than she did about Dodi, the inquest heard. Ms Monckton said: "It was clear to me she was really missing Hasnat and I think Dodi was a distraction from the hurt she felt from the break-up." Comment: It seems that William and Harry were quite close to becoming "the first heirs to the British throne with a Muslim stepfather." Jan. 14, 2008 update: Lots of news from the inquest into Princess Diana's death where Paul Burrell, Diana's butler, is in the witness box. First, Diana's mother, Frances Shand Kydd, had harsh words for her daughter's relationships with Muslim men, and Diana in turn intended to break with her over this, a British court was informed. Burrell reported on a conversation between the two six months before Diana's death. Kydd "called the Princess a whore. She said she was messing around with effing Muslim men and she was disgraceful and she said other nasty things." Diana responded by vowing never to speak to her mother again. Second, Burrell told about Diana's plans to marry Hasnat Khan. Mr Burrell said he was asked to look into arranging a private marriage between Diana and Mr Khan and went as far as consulting a Catholic priest about the possibility He had also begun preparing rooms at Diana's Kensington Palace home for Mr Khan. The couple split up a few weeks before her relationship with Dodi Fayed began. But Mr Burrell told the inquest he believed Diana still "held a candle" for Mr Khan and her new relationship was a way of making him jealous. In contrast, he did not have "the impression that Dodi Fayed was 'the one' in her life although he described the relationship as an 'exciting time' for Diana." Mar. 4, 2008 update: Hasnat Khan has spoken up and, as paraphrased by the Daily Telegraph, indicated that he was introduced Diana's two sons, Princes William and Harry. Khan said that if he and Diana "had married he would not have expected her to have converted to Islam. His only concern would have been which religion to bring up any children they had." 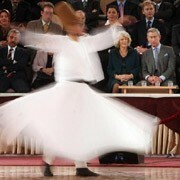 Prince Charles was guest of honour at a celebration of Sufi Muslim culture at Manchester United's Old Trafford ground where he was entertained by whirlers in traditional dress. Greeted by artists, religious leaders and musicians, he made his way into a hushed hall at the stadium where he enjoyed a musical recitation of the Holy Quran accompanied by a whirling dervishes dressed in traditional costumes. 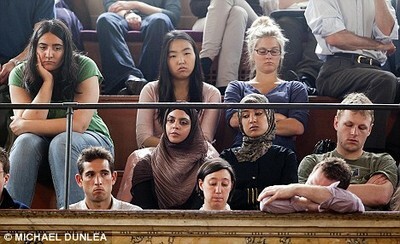 Not all of the audience at the Sheldonian Theatre was riveted by Prince Charles' speech on environmentalism. Mar. 16, 2010 update: On a visit to Poland, Charles took the highly ususual step to visit the small wooden Tatar mosque in Kruszyniany, chatting to the imam there, and sampling some traditional Tatar foods, including pirogue pierekaczewnik. 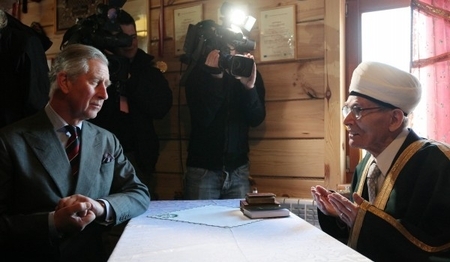 Prince Charles talking with the imam at the Tatar mosque in Kruszyniany, Poland. The inconvenient truth is that we share this planet with the rest of creation for a very good reason - and that is, we cannot exist on our own without the intricately balanced web of life around us. Islam has always taught this and to ignore that lesson is to default on our contract with creation. The Prince was in Doha attending the launch of the Qatar-UK Alumni Network, for Qataris who have attended British universities, when he told a group of guests: "You all speak such good English." Dr Mohammed Bin Saleh Al-Sada, chairman of the association and Qatar's energy minister, asked the Prince if he spoke any Arabic, and the Prince said: "I tried to learn it once but I gave up. It goes in one ear and out the other." Dr Al-Sada told him: "It's never too late to learn." Later, one of the Prince's aides confirmed that he has been having lessons in Arabic recently, adding: "He is enormously interested in the region." The Prince speaks good French, some German, and has also had lessons in Welsh. The newspaper story, by Gordon Rayner, adds a touch of local color: "All of the women at the reception were dressed head to toe in black, wearing a traditional shaila on their head and an abayya covering their body. ... All of the men in the room wore a traditional white thobe from neck to foot, with a ghitra on their head secured by a band called an igul." 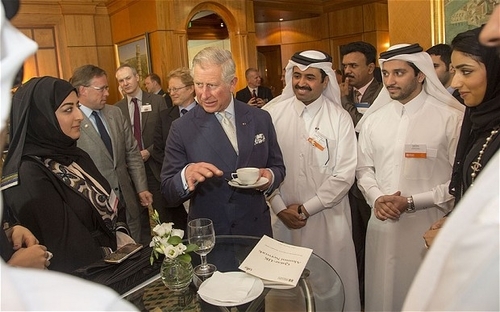 Prince Charles meets with Qataris who attended British universities. Comments: (1) Curious that the prince would travel the whole way to Qatar for something as minuscule as the launch of the Qatar-UK Alumni Network; that he did would seem to confirm either Qatar's prowess in Great Britain or Charles' affection for the Middle East, or both. (2) To see the connection between learning Arabic and conversion to Islam, see my lengthy blog at "The Arabist and Islamist Baggage of Arabic Language Instruction." Aug. 20, 2013 update: Off on a little tangent: Ezra Levant notes that Justin Trudeau, the new head of Canada's Liberal party, attended the Surrey Jamia Masjid in British Columbia during the evening prayer wearing an Arab jalabiya and while there took part in the prayer service, complete with the shahada, the Islamic profession of faith. Meanwhile, his wife Sophie "recently posed for a picture with Trudeau's mother, Margaret, in honour of Mother's Day. And in that photo, they were both wearing the Muslim hijab hair-covering. Why would you do that on Mother's Day - a secular holiday with no Muslim or ethnic characteristic to it at all? Why add in the Sharia element?" Oh, and his senior policy adviser happens to be Omar Alghabra, an Islamist well known to readers of this blog. Levant writes that despite these theatrics, he does not think Trudeau is a Muslim. 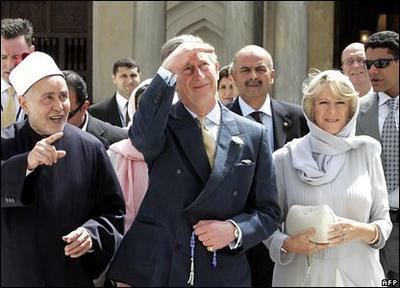 Dec. 18, 2013 update: In a surprise reversal, Prince Charles yesterday focused on the tribulations of Middle Eastern Christians at Islamist hands while visiting the British branches of the Egyptian and Syriac churches. We cannot ignore the fact that Christians in the Middle East are, increasingly, being deliberately attacked by fundamentalist Islamist militants. For 20 years, I have tried to build bridges between Islam and Christianity and to dispel ignorance and misunderstanding. The point though, surely, is that we have now reached a crisis where the bridges are rapidly being deliberately destroyed by those with a vested interest in doing so. This is achieved through intimidation, false accusation and organised persecution, including to Christian communities in the Middle East at the present time. Christianity was, literally, born in the Middle East and we must not forget our Middle Eastern brothers and sisters in Christ. Comment: Has something happened to open Charles' eyes to the dangers of Islamism? If so, this could be an important portent for Great Britain. 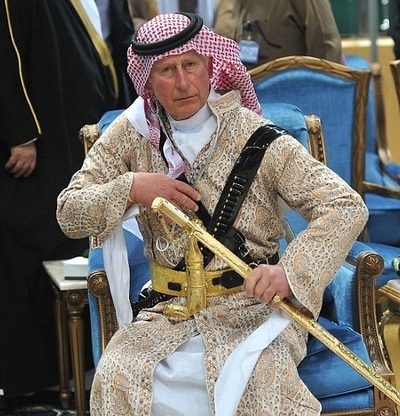 Feb. 18, 2014 update: Charles is again dressing up as a Muslim, this time to take part in a "sword dance" in Saudi Arabia. Prince Charles taking part in an "arda" dance in Riyadh. I had an argument with Prince Charles at a small dinner party. He said—very typically, it seems to me—"I'm sorry, but if someone insults someone else's deepest convictions, well then," blah blah blah ... And I said that a novel doesn't set out to insult anyone. "It sets out to give pleasure to its readers," I told him. "A novel is an essentially playful undertaking, and this is an exceedingly playful novel." "The Prince took it on board, but I'd suppose the next night at a different party he would have said the same thing. Nov. 5, 2014 update: Prince Charles recorded a video message calling on Muslim leaders not to remain silent about the persecution of Christians in the Middle East. It is an indescribable tragedy that Christianity is now under such threat in the Middle East - an area where Christians have lived for 2,000 years, and across which Islam spread in 700 AD, with people of different faiths living together peaceably for centuries. It seems to me that our future as a free society - both here in Britain and throughout the world - depends on recognising the crucial role played by people of faith. And, of course, religious faith is all the more convincing to those outside the faith when it is expressed with humility and compassion, giving space to others, whatever their beliefs. ... First and foremost, rather than remaining silent, faith leaders have, it seems to me, a responsibility to ensure that people within their own tradition respect people from other faith traditions. Charles said he did not want to be seen as Defender of the Faith, the title held by each monarch since Henry VIII, but as Defender of Faith in general. But he maintained that this conviction was rooted in his own Christian faith. "My own Christian faith has enabled me to speak to, and to listen to, people from other traditions, including Islam." Comments: (1) To my knowledge, in the 17 years I have been following the topic of Charles and Islam, he has never made such a statement in which he forthrightly mentions his Christian faith as he does here. (2) Charles' willingness to speak out on this topic is a possibly significant signal of a change in mood toward Muslims and Islam in the United Kingdom. "The radicalisation of people in Britain is a great worry, and the extent to which this is happening is alarming, particularly in a country like ours where we hold values dear. You would think the people who have come here, or are born here, and go to school here, would abide by those values and outlooks. ... how you prevent radicalisation in the first place is the great challenge. You cannot just sweep it under the carpet. But the most important thing is to remind people of the distortions that are made of great religions, and the original ideas of the founders of these religions. Often you find their message is so distorted by their putative followers. That's the tragedy and, of course, traditional Islam does not permit this sort of thing." "When I called myself Defender of Faith all those years ago I was trying to describe the inclusion of other people's faiths and their freedom to worship in this country. At the same time as being Defender of the Faith, you can also be protector of other faiths. From that point of view, it was very interesting that 20 years or more after I mentioned this frequently misinterpreted phrase, the Queen, in her address to faith leaders around the time of the Jubilee, said that as far as the role of the Church of England was concerned, it is not to defend Anglicanism to the exclusion of other religions but to protect the free practice of all faiths in this country. She was conveying what I was trying to say." Also, as reported by the Mail on Sunday, Charles "is to tell new Saudi king Salman bin Abdulaziz al Saud to his face that he should stop the 1,000 lashes handed down as punishment to Saudi blogger Raif Badawi for comments which the regime claimed were critical of Islam." Comment: Standing up for Middle East Christians, decrying Islamism, and keeping the traditional monarchical title: does this shift reflect just the thinking of one idiosyncratic prince or does it indicate something larger is going on in the country? Normally at Christmas, we think of the birth of our Lord Jesus Christ. I wonder, though, if this year we might ... also remember that when the Prophet Mohammed migrated from Mecca to Medina he did so because he too was seeking the freedom for himself and his followers to worship. Mar. 31, 2017 update: The historian Sally Bedell Smith documents in a new book, Prince Charles: The Passions and Paradoxes of an Improbable Life that in 2001, four weeks after the U.S.-led invasion of Afghanistan and two weeks before the start of the month of Ramadan, Charles called on the American ambassador in London, William Farish, to appeal to President George W. Bush to halt the fighting to "honor" Ramadan. Farish replied, "Sir, are you really serious?" To which Charles replied, "Yes I am." Farish noted that it would be difficult to halt a military invasion already underway, to which the prince protested: "But Americans can do anything!" This appeal, it bears noting, was not coordinated with or even known by the government of Prime Minister Tony Blair. Tried to read bit of Koran on way out and it gave me some insight into way they [Arabs] think and operate. Don't think they could understand us through reading Bible though. Much admire some aspects of Islam – especially accent on hospitality and accessibility of rulers. Also begin to understand better their point of view about Israel. Never realised they see it as a US colony. I now appreciate that Arabs and Jews were all a Semitic people originally + it is the influx of foreign, European Jews (especially from Poland, they say) which has helped to cause great problems. Surely some US president has to have the courage to stand up and take on the Jewish lobby in US? I must be naive, I suppose!